CH2C(CH3)2OCH3 Technetium (99mTc) Sestamibi higher energy y-ray (140 keV) also provides better quality images with contemporary gamma cameras. The recommended dose for 99mTc sestamibi when used for breast imaging is 20 to 30 mCi (740-1,110 MBq). When used for parathyroid imaging, the recommended dose is 25 to 30 mCi (925-1,110 MBq). Technetium ("mTc) Succimer Injection. 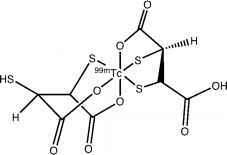 2,3-di-mercaptosuccinic acid (DMSA, succimer) forms a hy-drophilic complex when labeled with technetium-99m that is useful in evaluating renal function, especially in children. The pH-dependent preparation of 99mTc-DMSA begins with the addition of sodium pertechnetate (99mTc) to shielded reaction vial containing 2,3-dimercaptosuccinic acid, stannous chloride, ascorbic acid, and inositol at a pH range of 2 to 3. Various metal-DMSA complexes are initially formed, but over the 10-minute incubation period at this acidic pH, the hexacoordinate complex28 of three car-boxylic acids and three sulfhydryls produces a tracer with the highest renal uptake.5 Localization of such a complex prepared at a certain pH is not altered if the environmental pH is subsequently changed.29 This complex has a shelf life of 4 hours. The patient is injected with 2 to 6 mCi (74-222 MBq) of 99mTc-DMSA and images are taken 1 to 2 hours later. Technetium (99mTc) Sulfur Colloid. Technetium (99mTc) sulfur colloid (99mTc-SC) is a dispersion of particles larger than those found in solution, but small enough to remain suspended in the delivery matrix for a very long time. It is indicated for use by injection to assess functional capacity of reticuloendothelial cells of the liver, spleen, and bone marrow, to evaluate peritoneovenous (LeVeen) shunt patency. It is indicated orally to assess gastric emptying. Another use involves the intralymphatic or peritumoral administration for radioguided sentinel lymph node biopsy. After intravenous injection of 1 to 12 mCi (37-444 MBq) of 99mTc-SC, the tracer is rapidly cleared from the blood by the reticuloendothelial cells of the liver, spleen, and bone marrow. Uptake depends on the relative blood perfusion rate and the functional capacity of the cells. In the normal patient, 85% of the radiocolloid is phagocytized by Kupffer cells in the liver, 7.5% by the spleen, and the remainder by the bone marrow, lungs, and kidneys. Liver-spleen images can be acquired within 20 minutes of administration. Bone marrow imaging studies are performed 1 hour after injection of 10 mCi (370 MBq) of 99mTc-SC. Normal bone marrow will take up the radiocolloid, but diseased bone marrow appears as "cold" defects in patients with tumor deposits in the marrow. Technetium (99mTc) sulfur colloid use for GI studies includes gastroesophageal reflux (GER) and gastric emptying of solid food. Gastroesophageal reflux imaging is performed after having the patient swallow acidified orange juice mixed with 1 mCi (37 MBq) of 99mTc-SC. Normal patients do not demonstrate reflux. Gastric emptying imaging is performed after the patient swallows solid food (i.e., scrambled eggs or pancakes) radiolabeled with 1 mCi (37 MBq) of 99mTc-SC. In general, the normal gastric emptying half-time is less than 90 minutes for solid food.15 Imaging begins shortly after administration and monitors the migration of the colloid particles. 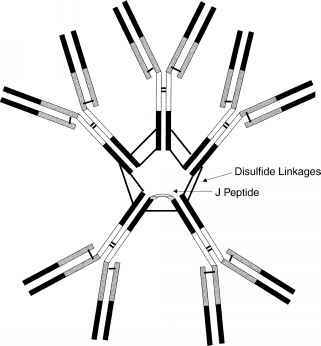 Identification of sentinel lymph nodes for subsequent biopsy in breast cancer31 and melanoma32 patients is accomplished by the administration of several injections totaling 0.5 to 1.5 mCi (19-56 MBq) of filtered (0.22-^m filter) or unfiltered 99mTc-SC. Smaller colloid particles may translocate more readily into the lymphatic system, whereas larger particles remain at the injection site.15,30 Imaging begins shortly after administration and monitors the migration of the colloid particles. Technetium ("mTc) Tetrofosmin (Myoview). Techne-tium (99mTc) tetrofosmin is a lipophilic cation complex33 clinically indicated as a myocardial perfusion agent for detecting regions of reversible myocardial ischemia in the presence or absence of infracted myocardium, identifying changes in perfusion induced by pharmacologic stress in patients with coronary artery disease, and assessing left ventricular dysfunction. Preparation of technetium (99mTc) tetrofosmin begins with the addition of sodium pertechnetate (99mTc) to shielded reaction vial containing tetrofosmin [6,9-bis(2-ethoxyethyl)-3,12-dioxa-6,9-diphosphatetradecane], stannous chloride, disodium sulphosalicylate, sodium D-gluconate, and sodium hydrogen carbonate. Initially, the reduced technetium-99m forms a weak complex with gluconate which undergoes a ligand exchange with tetrofosmin during a 15-minute incubation period at room temperature. The recommended shelf life is 8 hours. 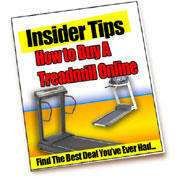 When it comes to pieces of aerobic equipment to buy, treadmills continue to be the most popular and the most valuable. And why not? They are simple to use and naturally intuitive. They burn calories effectively and offer a wide range of exercise options, whether walking, climbing, or jogging.